• 4D arms ht adjustable &arm caps slide in, fwd/back and pivot (option). •	This is an older model but still very adjustable. 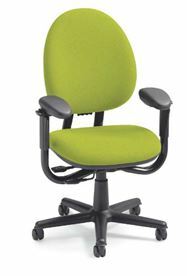 •	Less bells and whistles than the Leap and lumbar support is not adjustable. •	Great armrests though and Criterion Plus has same features as Criterion. •	Back stop controlled by small switch tucked under left rear side of seat pan. •	Armrests can be set narrower than most chairs which makes this a favorite pick for smaller users.